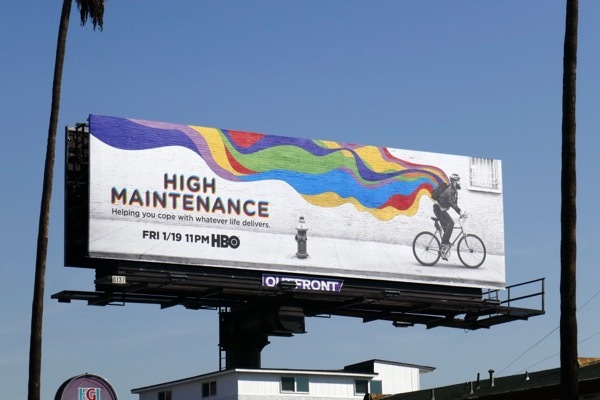 As another TV themed week comes to a close here at Daily Billboard, we thought we'd go out in high spirits by shining a spotlight on HBO's new pot dramedy, High Maintenance. 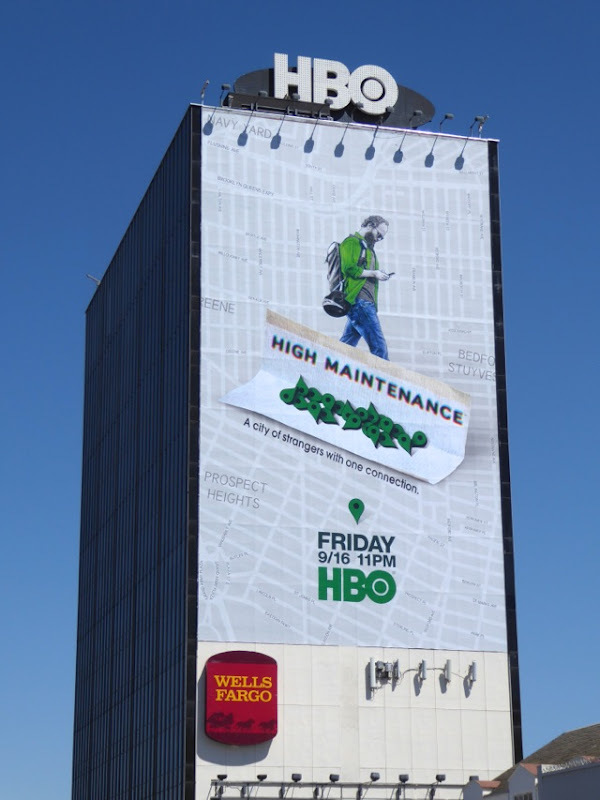 Based on web series by married duo Katja Blichfeld and Ben Sinclair, the latter also stars as 'The Guy', a Brooklyn marijuana dealer who delivers to a clientele as diverse as New York City. 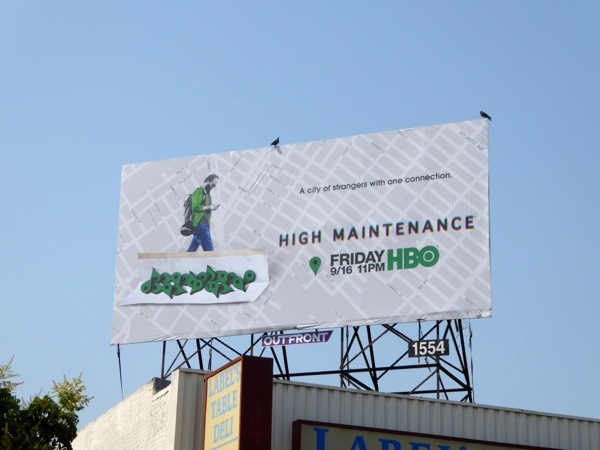 Not only is this series very timely with the growing the legalization of cannabis in the U.S., but also this image of a person head down walking along the street looking at their phone is such a part of our everyday culture these days. 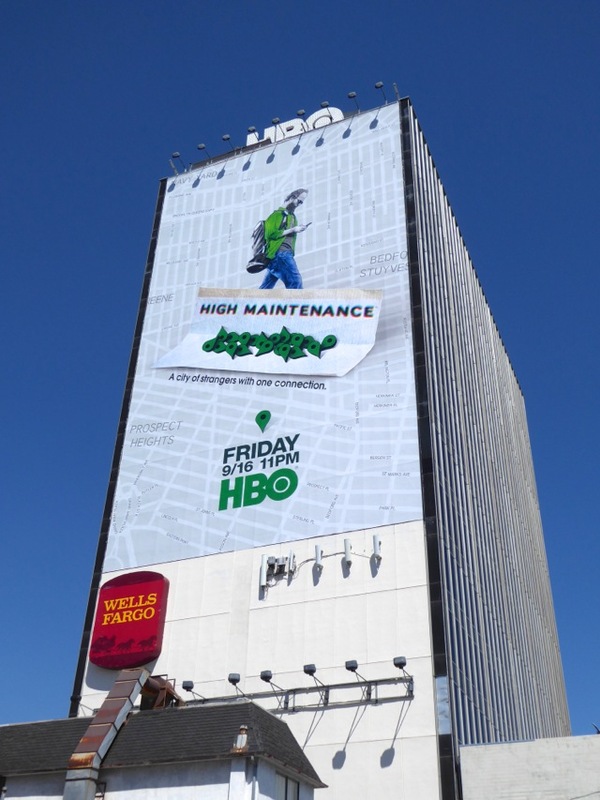 The street map in the background and the cigarette paper roll up filled with map icons also cleverly conveys the idea of this man traveling around the city and intersecting with people's lives. 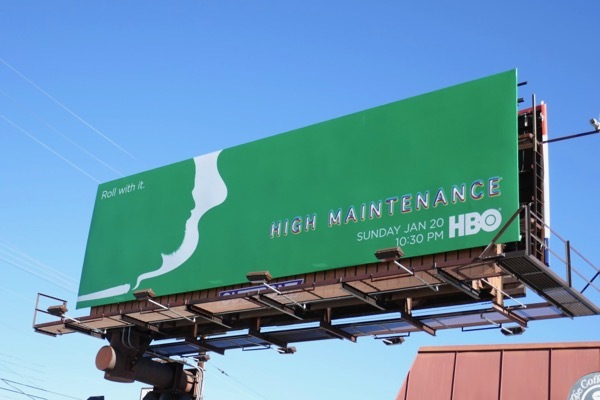 These witty High Maintenance billboards were first spied along the Sunset Strip on August 15, with additional landscape billboards, including the special extension cut-out, snapped along Santa Monica Boulevard and Pico Boulevard through August 25. 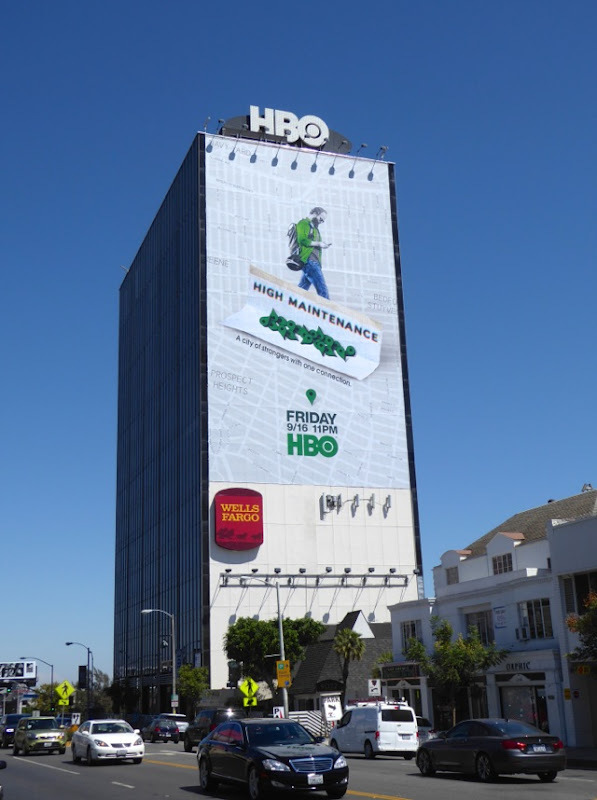 Meanwhile the giant-sized ad creative was photographed towering over eastbound traffic along West Hollywood's Sunset Strip on August 18, 2016. 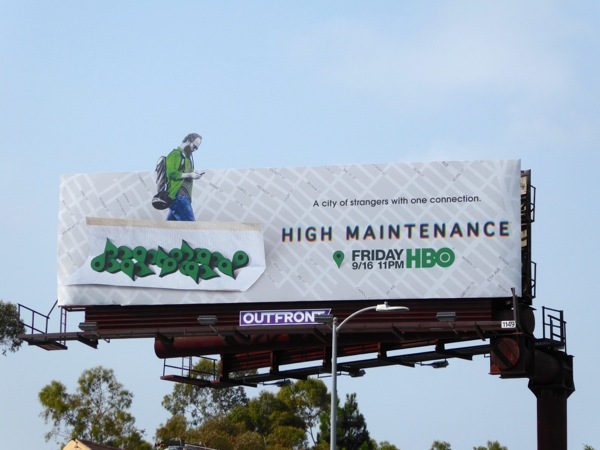 For more pot-themed ad creatives, be sure to also check out this movie billboard for stoner comedy Your Highness and these Weeds TV show billboards. Let's see how high audiences figures will get for HBO's new Friday night comedy drama this new Fall TV season. 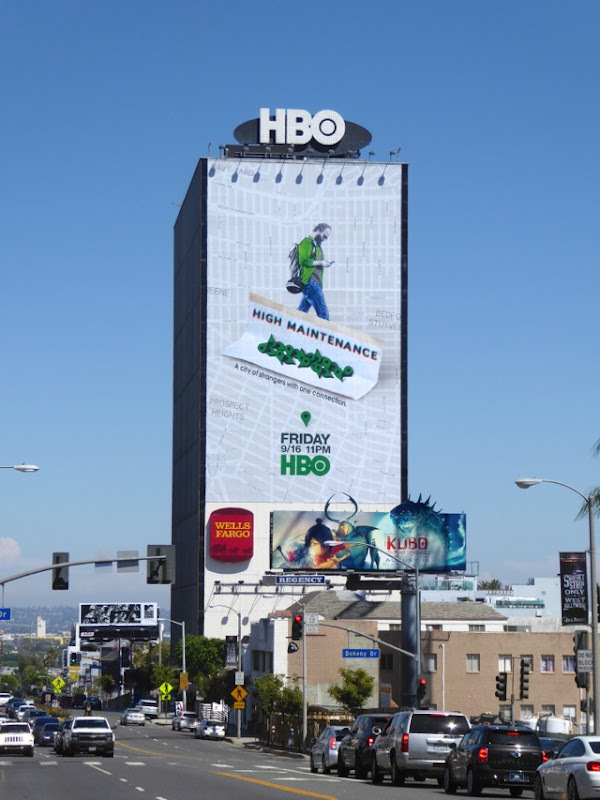 UPDATED: Here's also another eye-catching special cut-out extension billboard for the new show snapped along Sunset Boulevard on September 7, 2016. 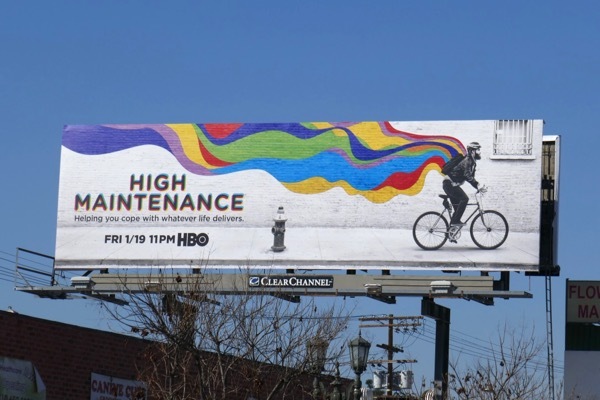 UPDATED: Here are some examples of the colourful sophomore season billboards for the pot comedy spied along Sunset Boulevard and Pico Boulevard from February 1 to February 5, 2018. 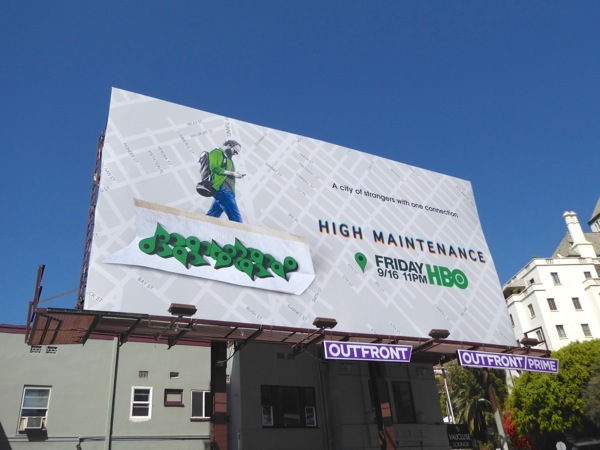 This returning show certainly seems less high-profile than some of HBO's other series and appears to receive far less outdoor support than Netflix's own Disjointed cannabis comedy with Kathy Bates. 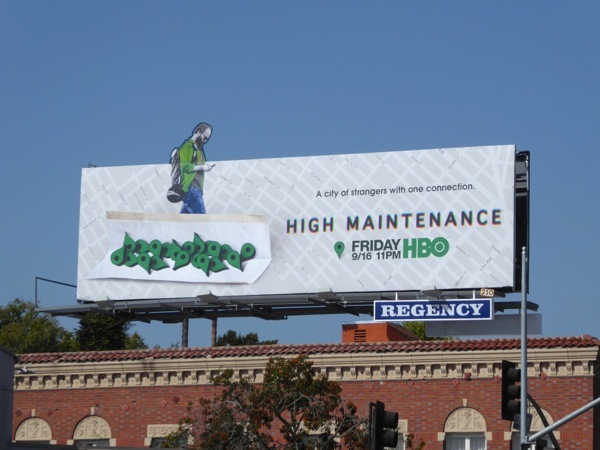 UPDATED: Here are some billboard for the third season of High Maintenance, and now that recreational weed is legal in California they seem even less provocative than they would have several years ago. 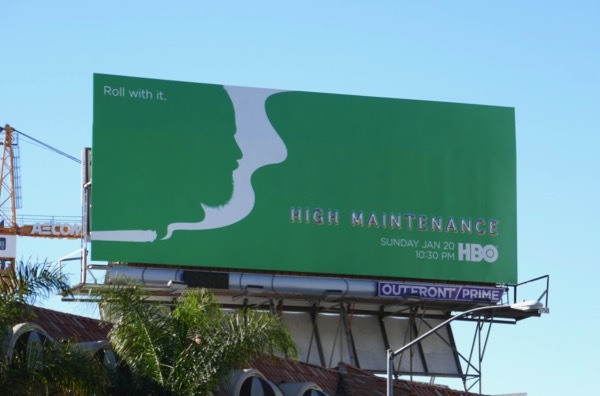 These green season three 'Roll with it' billboards were spotted above the Sunset Strip and 3rd Street from January 19 to January 21, 2019, and the smoky silhouette ad creative for the HBO series reminds Daily Billboard of this True Blood teaser billboard from 2009.